There is never an ideal time to get pregnant. Anyone who’s ever been pregnant can attest to this. Financially, emotionally, psychologically—you’re never going to find a moment when all these elements line up magically, AND you happen to be ovulating. “Unexpected” approaches this universal phenomenon from a couple different perspectives and with a lot of heart. 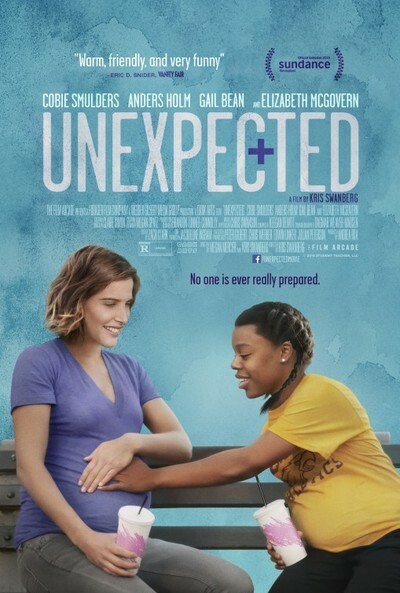 On paper, director and co-writer Kris Swanberg’s film may look like something sentimental and formulaic that you’d see on the Lifetime channel: Cobie Smulders stars as a high school science teacher in inner-city Chicago who discovers she’s pregnant at the same time as her star student, a senior with dreams of going to college. The two form an unlikely friendship as they attend prenatal yoga classes together, indulge their food cravings and support each other through the ups and downs of carrying a child. But Swanberg finds a pleasingly low-key tone throughout the film, which (blissfully) is especially true during the kinds of moments that usually are played for wacky laughs in pregnancy comedies. (Peeing on a stick, puking in a trashcan, dashing to the hospital, etc.) And the bond that forms between Smulders’ character, Samantha, and Gail Bean as the teenage Jasmine feels tender, genuine and unforced. Except for a bit of contrived conflict that arises toward the end, the connection between these two expectant mothers—who are at vastly different points in their lives—rings with a mutual kindness and compassion. Samantha encourages all her students to go to college, even as her own situation is in flux. The predominately black school where she teaches is shutting down at the end of the year, which will put her out of a job. She enjoys a modest but fulfilling life with her boyfriend (a quietly supportive Anders Holm from “Workaholics”), with whom marriage and kids were on the horizon eventually. That whole process speeds up, though, once she starts feeling uneasy and a pregnancy test comes back positive. Around the same time, there’s talk around campus that Jasmine also is expecting with her shy, older boyfriend. Although this vivacious, young woman has a 3.8 grade point average and her sights set on the University of Illinois, her plans appear to be in jeopardy with a baby on the way. Swanberg, working from a script she co-wrote with Megan Mercier, addresses the realities of Jasmine’s financial situation and her unstable childhood in matter-of-fact fashion. And that’s basically the extent of the plot: We watch and wait as the big day approaches for them both. The warm link between these prospective mothers grows as their bellies do. Swanberg doesn’t force the parallels between them, but rather allows each character’s story to play out with specific struggles and doubts. But as so many women do, Samantha debates the merits of staying home with the baby vs. going back to work, with all the guilt and what-ifs that accompany such a crucial decision. (Her well-meaning boyfriend thinks it’ll be a nice break for her to care for a newborn baby all day, which is hilarious.) Similarly, Jasmine wonders whether the costs of housing and tuition are feasible during her baby’s earliest years. Both women fear a loss of identity, even as they’re about to gain a new one—something Swanberg explores with intimacy and clarity. What gives this understated film real substance are the performances from its lead actresses. Smulders, who’s been a subtly capable supporting force in the Marvel movie world for years, radiates wisdom, confidence and heart, even in the midst of her character’s confusion. And she enjoys a lovely, effortless chemistry with Bean, who’s a real find in her first, major feature role. Bean has a magnetic energy about her, with a quiet strength and pure presence. “Unexpected” isn’t exactly earth-shattering cinema, but through its own honesty and grace, it’s eye-opening.